Eine eher beiläufig entstandene Datei, die sich mit dem Quatsch von Meyssan und anderen Verschwörungstheoretikern befaßt. Mein Ziel war bekanntlich nie, in die Märchenwelt der Bushisten einzusteigen und daraus zu argumentieren. Im Gegenteil: dort liegen ka die größten Lügen zutage, dort galt und gilt es das Hauptaugenmerk hinzulenken. Aber der Meyssanquatsch arbeitet de facto den Bushisten zu - denn er lenkt von der Täterfrage ab durch Detailhuberei in technischen Fragen, die zudem auch noch falsch gestellt und beantwortet werden und auch noch von Faktenignoranz strotzen. Meyssan und seinen idioten kommt zugute, daß das FBI alles an Beweisen, was nicht niet- und nagelfest war (natürlich auch Videos) konfiszierte oder zerstörte. Nicht nur bzgl. des Pentagons, wie Meyssan trompetet als habe das FBI böseböse den Herrn Meyssan um Boeingfotos bringen wollen. In jeder Sachfrage wurde beschlagnahmt, so daß bestimmte Fakten schwer zu belegen sind. Aber nicht unmöglich. Eine einzige Leiche aus der AA77 im Pentagon - und Meyssans Märchen stirbt. Leider werden zerfetzte Leichen nicht im Internet präsentiert - aber nicht für oder gegen Meyssan, sondern prinzipiell. Nun: ein Boeingrad, ein Ehering, ein Gepäckanhänger, Zeugenaussagen usw. tun es auch. Wenn man sie nicht ignoriert. STOP That Hunt. Think. And Ask. aber AUCH die Schlankheit des Rumpfs. Mit der "Projektil-Theorie" ist das schmale Loch also vereinbar - also auch z.B. mit einem Cruise-Missile, wie Meyssan nun (s.u.) hypothetisiert. Ein LKW mit Explosivstoff (erste Meyssansche Mutmaßung)kann nebenstehendes Abrissfoto aber nun wirklich nicht mehr erklären. Aber auch nicht eine beim Aufschlag explodierende Rakete/Cruise Missile o.ä. : woher kommen dann die runden Löcher in den inneren Ringen des Gebäudes? Das WTC: ein Glas- und Stahlbau (+ Beton). 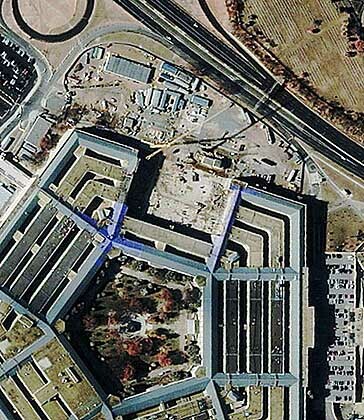 Das Pentagon jedoch solider Betonbau. Innen verstärkt durch Stahlsäulen, Kevlar an den Paneelen, bombensichere Fenster. Nur im betreffenden Flügel !). Anderes Verhalten einer Aluhülle. Alu verbiegt, verbrennt- verhält sich halt nicht wie Stahl. Läßt sich mit einer Schere schneiden ... jaja, wenn genügend dünn. sie zunächst dem eigenen Denkschema entgegenkommen! Never trust foto- oder video- evidence! (Not even this one) They seem to be obvious and simple. If you try to avoid complex thoughts, complicated arguments, doing some work of research yourself: then better have a beer and trust your politicians. # Hier wird anhand der abgeschnittenen Lampen bewiesen, dass das Objekt, das ins Pentagon flog, größer gewesen sein muss als ein Cruise Missile o.ä. - die Spannweite ist halt objektivierbar. # Hier eine Bilderserie mit Berechnungen, die zeigen, dass Meyssan die Breite der zerstörten Pentagonfassade unterschätzt. Wie kommt dieses Rad einer Boeing in den Schutt des Pentagon? "During an interview earlier this week, Koch delicately handled eerie mementos of the crash found during cleanup: Whittington's battered driver's license. One granddaughters' luggage tag." Hier ein Satz Zeugenaussagen über Körperteile und Flugzeugtrümmer. Nicht nur von Penatagonleuten, denen man zwar gerne mal mißtrauen kann, aber nicht muß - sie waren natürlicherweise zuerst am Tatort. Viele unterschiedliche Quellen. Und nochmals: es gibt kein Problem mit den Meyssan- Leuten dann, wenn sie diese oder jene Aussage/ Fakt/ Foto widerlegen würden. Mein Vorwurf lautet: sie nehmen bewußt nicht zur Kenntnis, um Schuldige im Nirwana vermuten zu können. In genau dem Nirwana, in dem auch der Ewige Jude rumturnt. Und das, während immer offensichtlicher wird, WER DAS DING WIE GEDREHT HAT. Wem also nützt der "Hunt the Boeing" -Mist? "He broke through jammed doorways, crawled through holes made by the plane's landing gear and came across walls of burning plane parts and body parts." "He lurched down a pile of wreckage and saw that the smoke before him seemed backlit, and that it brightened further as he passed through a hole in the Command Center's back wall, into a room he'd never seen before, filled with overturned desks and smashed computers. He climbed over the desks and through another hole, and into the golden sunshine of a clear September morning. Shaeffer stood on a service road that circled the Pentagon between the B and C rings, a chunk of the 757's nose cone and front landing gear lay on the pavement a few feet away, resting against the B Ring wall." "I thought it was a terrorist bomb. . . .But then I saw the landing gear. It was on the ground in the alley between the B and C rings. When I saw it there, not only did I realize an airplane had struck the Pentagon but it was clear that the plane had come through the E, D, and C buildings to get there." September 11: An Oral History, ed. by Dean Murphy, p. 216. "After helping establish a triage area in the Pentagon courtyard, Carlton walked into an alleyway between the second and third innermost rings of buildings. A set of landing gear lay about 20 feet away." The Richmond Times-Dispatch, 9 September 2002, p. A-3. "I was having trouble breathing, so I stepped into the open breezeway between C and B rings to get some fresh air. I saw these two holes where the aircraft had come through. You could see an aircraft tire that had come through three rings of the Pentagon, and there were charts and other stuff that was obviously from the aircraft." "I went back in and found myself in the open air space between the B and the C Ring on the inner aspect of the C Ring between the 4th and 5th Corridors. There was a big exploded hole in the wall that was pouring out thick black smoke, and there was a big plane tire sitting there, and evidence of human remains." "They found an area where fire surrounded a hole in a wall that was blown out. They heard cries from people who were trapped and saw a plane tire." The Associated Press State & Local Wire, September 27, 2001. "In the C and B rings the plane had punched a hole you could a drive a truck around in, and I saw an airplane tire. It made it very real." "Rose returned to the roadway between the B and C rings, where he presented himself to FBI agents. They asked him to help bag the body parts already scattered about, and which now washed from the Navy Command Center on the streams created by broken water mains. At one point, Rose saw a severed foot and ankle lying beneath a piece of purple fabric. When he reached for the cloth to move it out of the way, he discovered that it contained a leg." "This time, according to Correa, he found out what caused the horrific attack he survived earlier that morning; he saw the nose cone and the landing gear of the airliner." "Pipenger can stand in the Pentagon's inner drive and point out where American Airlines flight 77 came to rest with its landing gear protruding slightly above the roadway." "A nine foot diameter exit hole was created in the wall of C ring and the remainder of the debris from the impact ended up in the alley between C ring and B ring known as A & E Drive." "The plane's inertia carried aircraft remains all the way through the building coming to rest on the outside walls of our offices (in B-ring). We discovered cockpit wreckage at our feet while attempting to rescue people from a Navy operations area….You'll see a circular hole, that's the exit hole the cockpit and front tire assembly made through the Navy Operations Center." "The nose of the plane just barely jutted out into A/E Drive (the street that runs around the inside of the building). It made a perfectly round, 5-foot hole in the wall. There was one set of landing gear (presumably from the nose) out in A/E Drive. But most of the plane's skin was in pieces not much bigger than a piece of notebook paper." "We came to an opening between the rings. "Look", I was told and I followed the beam of light to a rather small perfectly round hole ... maybe 10-12 feet in diameter in the wall with a pile of rubble in front of it. At closer inspection, the rubble with littered with clothes, arms, and legs. "That's where the nose of the plane finally stopped", I was told. They had already removed the metal pieces ... all that was left was the hole." Hasn't it occurred to you that out of respect for the dead, grisly photos of body parts were not released? How terrible logic it is to say that if I haven't seen a photo of something, it must not have existed? Are all these people liars? Rose marveled as he recalled shouting orders at generals among the volunteers bagging body parts around the wreckage. "I sort of became the old sergeant major out there," he said. "People, regardless of rank, fell in and did what was needed." After a minute he saw a hand jutting from the wreckage, fingers splayed. He grabbed it, and the fingers closed tight around his. He dug out a sailor, the first of seven he and McNair and their compatriots rescued. Later still, Rose returned to the roadway between the B and C rings, where he presented himself to FBI agents. They asked him to help bag the body parts already scattered about, and which now washed from the Navy Command Center on the streams created by broken water mains. At one point, Rose saw a severed foot and ankle lying beneath a piece of purple fabric. When he reached for the cloth to move it out of the way, he discovered that it contained a leg. So much water poured into the road that Rose and others positioned themselves in front of the storm drains, to keep body parts from sweeping away. He saw organs, in addition to limbs, and wondered whose they were. The Virginian-Pilot, September 9, 2002. As the day wore on, the rescue efforts became instead, a grim search for body parts. “I picked up a child's hand. That was it. Just a child's hand and that's when I got angry. To wonder why someone could do this. You can come after me. I'm a soldier. I have sworn to protect and defend, but that wasn't right,” says Rose. Erckenbrack spent the rest of the day on stretcher teams, attempting to penetrate the inner court of the Pentagon to search for survivors. He broke through jammed doorways, crawled through holes made by the plane's landing gear and came across walls of burning plane parts and body parts. "The smoke was so bad you couldn't breathe and you almost involuntarily closed your eyes," Erckenbrack said. Roll Call, "Pentagon Rescuer Receives Medal for Bravery," by John McArdle, July 22, 2002. Since most bodies were charred beyond recognition and some were just body parts, we did not know for whom we were praying. Many were totally indistinguishable. Some had missing limbs and other bags had just limbs. Anyway, today I went in with the engineers, to clear a path through the debris on the ground floor, toward the center of the impact area. We were told to leave any body parts, flesh, clothing, etc. as we found it, for removal by the FBI. Álvarez said she and her fellow workers sorted through debris from collapsed Pentagon walls and pieces of the hijacked airplane. They found the box cutters used by the hijackers to commandeer the plane, identification papers, money, jewelry, and body parts. "These pieces of bodies, we treated like precious treasure," Álvarez said. "We knew this was somebody's family member. 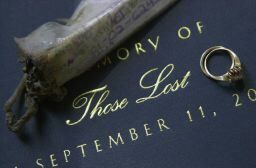 We knew they were waiting for the bodies to be returned so they could bury them properly and begin the healing process." Álvarez said one of the disturbing aspects of her job was recovering the items of children who had been on board the plane. "It was upsetting to find children's shoes, their little suitcases and their stuffed animals," she said. She also recalled participating in the recovery of the body of a friend of hers. "I entered the Pentagon once. The one person we pulled out whose body was intact was a friend of mine. His uniform was perfect. His ribbons, his belt and his shoes were clean. I thought, 'How befitting a hero.' I said a prayer over him, and then they zipped up his body bag." Picking up body parts, and pieces of aircraft at the Pentagon, Álvarez said she would pray, "Help me Jesus. Please don't let me cry yet, because I will never stop, my mask will fog up and I have a lot of work to do here." Neither the depth of the incursion nor the massive devastation inside the building was readily apparent as flames burned behind blast-proof windows. Huge heaps of rubble and burning debris littered with the bodies and body parts of 188 victims covered an area the size of a modern shopping mall. The ACPD provided three 20-person teams that worked a 12-hour shift on alternating days supporting the FBI’s evidence recovery sifting operation in the North Parking Lot. This was physically exhausting work that was also psychologically stressful. These officers raked through the debris searching for evidence, body parts of victims, and classified materials. The sifting operation produced about 70 percent of the body parts processed at the morgue. And now here is my transforming experience. I talked to the Rescue Workers.... the “Grunts” who go in and put the broken bodies in the blue bags....who are now sifting, by hand, through all the debris searching for personal effects and body parts. Nelson Gracia-Cruz, mortuary affairs specialist in the U.S. Army Reserve. I remember I was wearing my white Tyvex suit, my gloves, my mask. The place was still smoking. The stench was horrible. You could smell burning fuel and human flesh. I was sifting through a big pile of rubble that the guys with the heavy equipment had pulled out of that huge, stinking scar in the building. I reached into the pile, and the first thing I pulled out was a finger. Not burned, not shredded. Just an entire finger that used to belong to a human being. I couldn't stop shaking. I found a lot of horrible stuff afterward. Skin, hair, bits of clothing. Baby pictures. Wedding bands. Looking down at my feet was a body part. 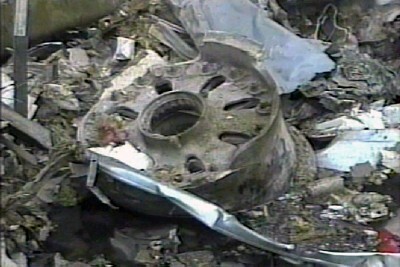 Parts of bodies, plane debris, and luggage littered the ground. 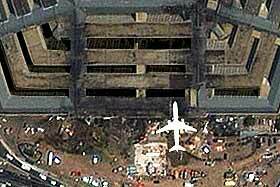 Twisted, melted pieces of plane were evidence of the extreme heat and force that had been thrust into the building. - es ging ihm um einen Krieg um unsere Köpfe. Also stellen wir uns einen Schachspieler auf der anderen Seite vor. - Er hatte den ersten Zug. Er PLANTE ihn. - Er führte ihn durch. - Er konnte mit der ersten Reaktion rechnen. Welchen Anlaß haben wir anzunehmen, dieser Schachspieler sei dann vor Freude tot vom Stuhl gekippt? Keinen. Er hat seit Monaten beobachten können, dass die Internetgemeinde Fragen stellt. Bohrende Fragen nach Widersprüchen, die sich nicht mehr aus der Welt räumen lassen. b) desavouieren durch Lächerlichmachen der Fragesteller. Er hat Geld, Einfluß und arbeitet geheim. Drei Vorteile, die er auch weiter nutzen wird. Dagegen hilft nur: kollektive Schlauheit. Die Demokratie der Internettis. auf "medienanalyse - international" wurde diese seltsame Kontroverse nicht ausgetragen. Es gab einen Flug, es gab eine Maschine, es gab eine Besatzung und Passagiere, und somit sind fehlende Beweisfotos recht unerheblich. Abgesehen davon, dass wir die Beweiskraft von Fotos/Videos nun wirklich x-mal hier in Frage stellten. Den Versuch, mit aller Macht eine angebliche israelische Verwicklung zu konstruieren, tragen wir ebenfalls nicht mit. #e frightfull deception - eine Buchbesprechung Meyssans - in Frankreich also schon der 2. Bestseller in Sachen 11.9.
ein kommentierter Kommentar zum 11.9. Welchen Sinn macht die Frage nach dem WIE? Bei einem Mord sind das WIE und die Frage nach dem Motiv natürlich wichtig. Aber die Hauptfragen bleiben noch immer erstmal: WAS passierte und WER tat es. Das WIE und "cui bono" können als Zusatzfragen mithelfen. Sie dürfen aber nicht den Blick verstellen. Der link zu den Pentagon-Fotos steht seit Monaten auf /finger.html - unter dem Aspekt der seltsamen Präzision des Einschlags. Die Fragestellung nach Zusatzexplosionen wurde schon vor vielen Monaten auf /finger.html ad acta gelegt (siehe 20)Hypothesen). U.a. weil sie in der FAZ und auch in einer TV- Dokumentation erschöpfend behandelt wurde. Aber auch, weil sie NICHT NOTWENDIG ist. Einen alternativen Tathergang zu untersuchen, bevor nicht der offizielle Hergang geklärt ist, lenkt schlicht nur ab von denen, die die Widersprüche bei der offiziellen Version vertuschen wollen. It makes no sense to invent plane and passengers and so on (or to hide them in a cave in Langley deep down under the CIA headquaters) - where are they if they did NOT hit the pentagon? (like Meyssan did) and then one month later -whow!- to tell the public how dumb they are to believe in these "conspiracy theories" INCLUDING all the real evidence which was found for instance by Jared Israel. "Why did the whole security apparatus not work? - so that a new security regime with new police measures can be installed inside and outside the USA ...?" on) was NOT guarded by his security staff, although any plane from orlando, miami, jacksonville could have hit him in minutes. So they KNEW he was not endangered. every good crime-movie it is shown that eyewitnesses are not good witnesses. To hunt the boeing is getting people to follow a red herring. 2) die Theorie eines explodierenden Lastwagens vor dem Pentagon wird ersetzt durch die eines cruise missiles o.ä. Durch letzteres wird die Menge der Augenzeugenberichte, die ein fliegendes Objekt in das Pentagon haben stürzen sehen, aufgefangen. Die Existenz eines realen Flugs AA77 bleibt bei Meyssan seltsam unberührt. Kryptische Bemerkungen über mögliche Fälschungen der Anrufe aus den Flugzeugen (denen nachzugehen ist) helfen nicht über die Frage hinweg, wo die Passagiere und der Flieger denn nun wirklich sind - wenn nicht im Pentagon. Auch die Einbettung der Pentagon-Problematik läßt offen, weshalb in zumindest zwei Fällen (dem WTC) reale Flugzeuge zur Zerstörung benutzt wurden, für die angeführten anderen Fälle jedoch andere Werkzeuge benutzt worden sein sollen. Selbst wenn dies der Fall wäre: warum hat die CIA dann diese Umstände nicht auch bin Laden "in die Schuhe geschoben"? Meyssan führt für seine Behauptungen keine Quellen an. Die Eindimensionalität bleibt erschreckend. Aber - und das ist anzuerkennen - er wirbelt Staub auf. Die offenen Fragen, die er benennt, bleiben offen. Seine Theorien und Festlegungen, die diese offenen Fragen schlüssig beantworten sollen, sehe ich noch immer als NICHT hilfreich an.